A unique opportunity to experience the historical and architectural wonders of Athens, the cradle of Western civilisation, and to discover its aromas and flavours in the best restaurant in Mikrolimano. After leaving the port of Piraeus, we drive by coach past the naval port of Zea. It was built by Themistocles as a defence against the Persian Empire in the early 5th century BC. We then arrive in Athens, the cradle of Western civilisation and the capital of Greece. Approximately one hundred metres above the city stands the Acropolis, which dates back to the 5th century BC, the golden age of Athens. We make a photo stop at the foot of the famous steps before continuing our excursion. We see the most famous monument in all its splendour: the Parthenon, built as a temple to honour the goddess Athena, the patron deity of Athens. Our panoramic tour continues in the direction of the imposing Panathenaic Stadium, the only large stadium in the world to be built entirely of white marble. Traffic permitting, we have a short photo stop. We continue our tour, driving past the University, the National Library, the National Academy and Syntagma Square, the Greek Parliament and the Tomb of the Unknown Soldier. 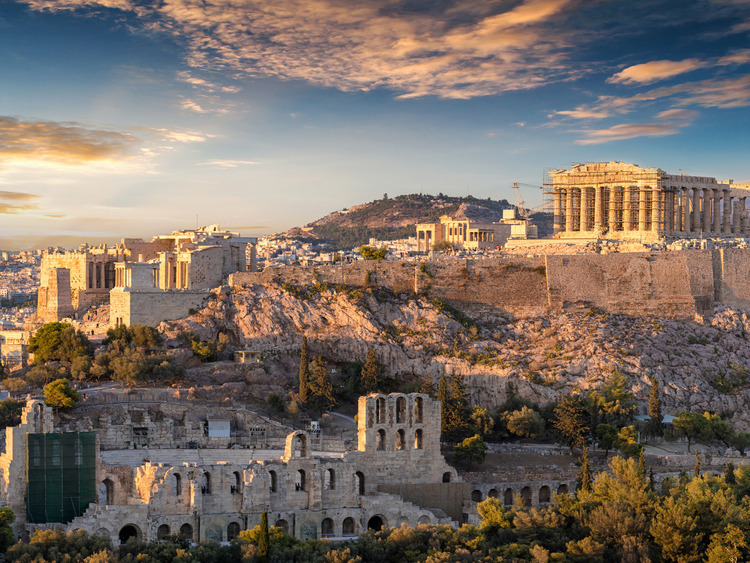 We leave the coach and set off on foot to explore the oldest part of Athens: Plaka, home to elegant neoclassical buildings, ancient monuments and shops with an antique aura, interspersed with typical restaurants, cafés and boutiques. We admire in awe the Old University, the Tower of the Winds, the Ancient Agora and the Choragic Monument to Lisicratus. After a little of shopping, we return to our coach to continue on to the beautiful seafront at Mikrolimano, which means "little port" in Greek. The small fishing boats sheltered here form the backdrop of a wonderful panorama. It is not surprising that this port, second only to Piraeus, attracts tourists from all over Attica. In one of its many typical seafront restaurants, we sample the delicious local cuisine, accompanied by the joyous melodies of sirtaki, typical Greek dancing.